Yesterday felt like an episode of Extreme Home Makeover as we feverishly worked to finish and tidy things up before the big reveal. 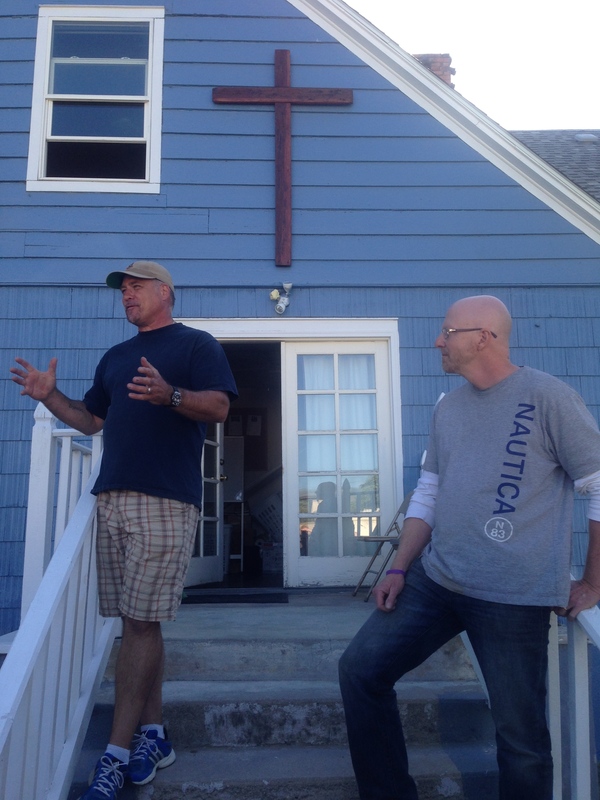 Our men climbed ladders, spread paint, removed carpet, cleaned floors, installed molding, painted baseboards, cut grass, installed lighting, and a dozen other things — including the installation of a wooden cross above the entrance to the home. And all of this happened in a joyous atmosphere with music from the local Christian radio station filling the house. We had a blast, motivated to work non-stop by our shared mission. As the time for the dedication of the home approached, invited guests started to arrive. All of the local YWAM (Youth With A Mission) staff pulled up in a big 16-passenger van. Great group of young people preparing for service around the world. Others who have been helped by the ministry also showed up. Everyone mingled and talked on the lawn, enjoying the absolutely perfect weather. At 6:00 PM, Chad Prigmore and Doug Hardy spoke to us about what this additional house will mean to their ministry to the homeless and those whom they serve. Chad surprised us all by announcing that this house will be officially known as the Kingsland Ministry Home — a place where people in need will always find help and hope in Jesus. What a cool blessing. This home will be an extension of what we are all about at Kingsland: loving God and loving people in meaningful ways that bring glory to God. I am grateful for Brian Stone, our Generations Pastor, and Gill Harris for their leadership of our men’s ministry. 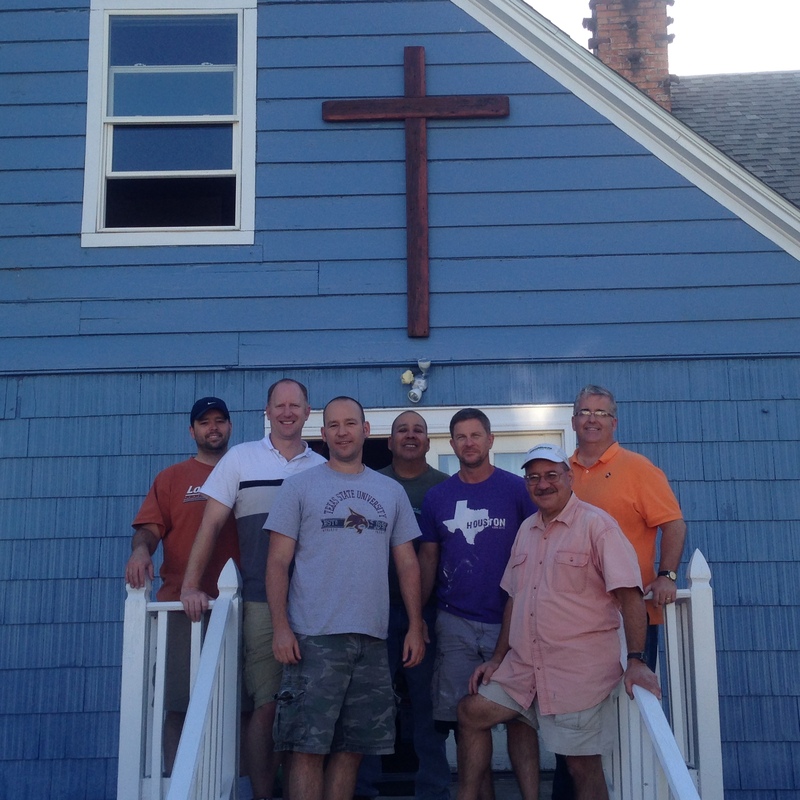 I am also thankful for each of the men who took time to travel with us to Idaho to complete work on the house. And I’m thankful for those who provided the funds that enabled us to assist Chad and Doug with this ministry initiative in Boise. The investment of time and resources here will yield fruit for the kingdom of God for years to come. Later today, our team will head a couple of hours north of Boise for a shared adventure. We will hike one of the most scenic trails in the state with some of our new friends. Although tired, our guys are ready to hit the trail and enjoy the outdoors. Like our shared mission, our shared adventure will give us the opportunity to strengthen the ties that bind. I’m looking forward to a good day of fellowship with a group of guys I have come to love and respect even more as we have worked shoulder-to-shoulder at the Kingsland Ministry Home. Omar, your energy and level of commitment never cease to amaze me, and I think I’ve figured out part of your secret. It seems that always, either before, during, or immediately after a major journey or project, you arrange time to get away into God’s natural world, either alone or with friends. I’m convinced that it’s there, in the woods and along the trails, that you draw closer to God, and recharge your batteries, both spiritual and physical. I often see God in the face of a flower, or hear His voice in the song of a bird, I feel His humor in the silly antics of a squirrel. I can only imagine what you experience in your wilderness encounters. Always, always – continue to make time for those encounters. Amen, Lanni. Love connecting with God in His beautiful outdoors.